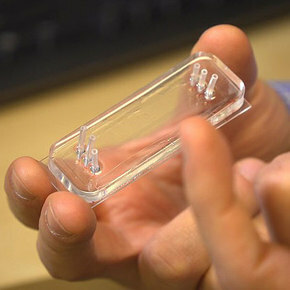 A microfluidic device able to measure the blood’s clotting ability could help doctors determine when a transfusion is necessary. Developed by a team from the University of Washington, the device features a pattern of tiny blocks and posts protruding from the base. As the blood sample flows around the obstacles, the platelets are activated and stick to them, eventually pulling towards each other. Sensors in the post measure how much pulling force the platelets are applying, with the results delivered within minutes—helping doctors decide if a transfusion is necessary.